When you embark on the process of writing an essay, chances of you forgetting about your audience are rife. Whether you have given it a thought or not, every time you write an essay, or even a research paper, you are addressing an audience. The audience can be generalised, or at times, you might know some of them the individuals in the audience. It is crucial to keep the audience in mind when you are coming up with any piece of writing. This helps in making sound decisions on what information to include and what to discard, how to structure your ideas, and how you are going to support your argument. For instance, you can imagine yourself writing a letter to your mum about the first month in college. You have to think of the kind of information that you want to include in that letter, and what to leave out. In the same context of writing a letter, if you are addressing your best friend, the content will not be the same. The two letters are going to have different content because you are addressing different audiences. How to identify your audience? The lessons that you want the audience to derive think about or assume about you. In other words, think about the impression that you want the audience to take home about you. 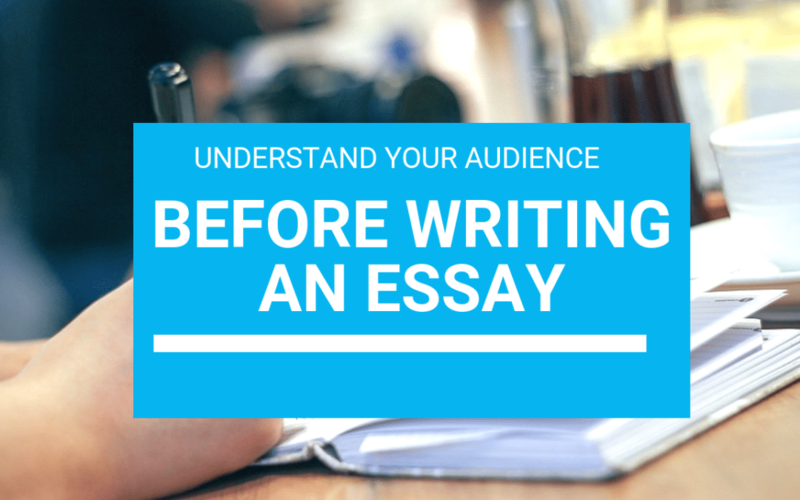 If you know the kinds of audience you are addressing in your essay is important. It helps in determining the kind of content that is going to appear in your essay. If your essay anchors on a specific topic, the content might vary depending on your target audience. Simply put, you can have a specific topic, but it is also crucial to have a specific audience in mind. For instance, if you are writing an expository essay based on the best techniques of becoming a better soccer player and you are addressing beginners in this field, the information will be different as opposed to when you are writing to an audience who are well versed in this field. In the first example, the idea is to communicate basic techniques built in a situation where you are addressing those who have been playing soccer; your content must be more advanced. Other essay writing recommendations about understanding the audience helps the writer in answering the questions that arise frequently. There are those who wonder if it is important to explain the use of jargon or abbreviations. If you know your audience, it is easy to answer this question. If your essay audience understands these abbreviations, there is no need for explanations. On the other hand, if you are writing to professionals in a specific field, jargon is applicable, but if you are addressing a mixed group of audience, you have to explain certain terms. One of the best essay writing recommendations is to incorporate your audience into your thesis statement. As such, you can develop and sustain them throughout your writing. How much are you explaining? When writing your essay, the amount of information you want to provide is based on the type of the audience that you are addressing. To a student, this is where you show your instructor that you know your material perfectly. When it comes to an academic situation, your instructor is the only audience that you are addressing. However, you need to be careful not to customize your information with his level of knowledge because you risk omitting crucial information. Many instructors are very knowledgeable on your topic than you are or any other average reader. As such, ensure you do not omit information that would help in balancing your paper. The relationship between you and the audience can determine the tone that you are going to use in your piece. For instance, if you are in a position of authority that your audience, you can be more instructive, but this applies to situations where one is writing an employment memo. On the flip side, if you are addressing your boss, you have to use a more formal and polite tone. You can make suggestions instead of giving directives. The audience can either have more or less knowledge concerning your topic. They can be familiar with jargons and terminologies or not. Sometimes the audience may or may not have the background knowledge on the topic that you are writing about. This helps in knowing the amount of information you can leave out or include in your essay or any other paper you are writing. The idea is to provide the information that the audience needs without overestimating or underestimating their level of knowledge on the matter. Is the audience agreeing with your or not? Before you start writing, you have to ascertain if the audiences are going to agree with you or not. This helps in writing in a manner that appeals to them. If you are writing to an audience that agrees with your school of thought, You have to emphasize the importance of their point of view. You can argue in favour of particular results. However, you have to avoid flattery or excessive compli9ments to maintain sincerity in your essay. Trying to outline after you are done writing – you can look at each paragraph separately and write the major point of each paragraph on a piece of paper for allowing the order of their discussion. This outline must reflect what you meant to say logically. Understanding the audience is crucial in every type of paper that you write. It helps a lot in making revisions where necessary as you continue to make your argument better. Essay writing techniques take into account the full impact of the audience because it underpins the tone and the content that is going to be included in the entire piece. If you think about your audience differently, your essays will never be the same. You improve your writing and express your ideas with more clarity especially if you are targeting a specific audience.